Closing parishes is painful—but there’s a better way to do it. 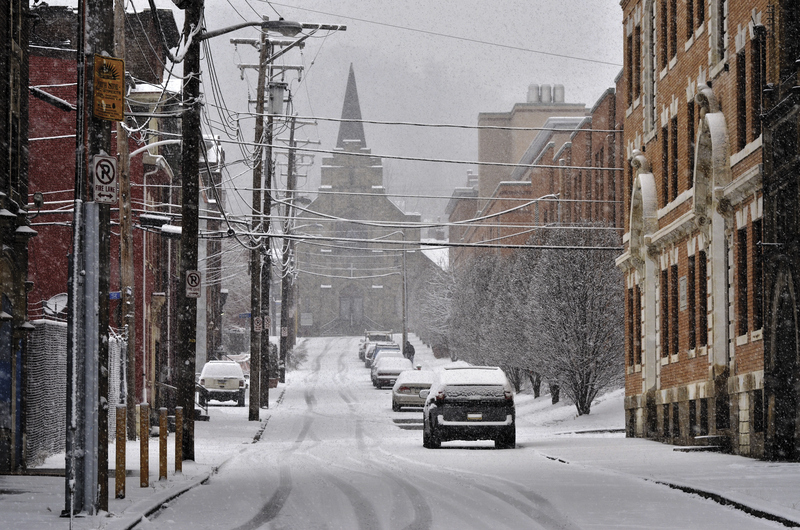 A snowy street in Pittsburg. On April 28 Bishop David A. Zubik announced plans to reduce the Pittsburg diocese’s 188 parishes to 57 by 2023. (Photo via iStock). Like many Catholics across the Northeast and Midwest, parishioners in Pittsburgh are adjusting to a difficult new reality. On April 28 Bishop David A. Zubik announced plans to reduce the diocese’s 188 parishes to 57 by 2023. The parish closings follow years of falling Mass attendance—the diocese reports it is down by more than 40 percent since 2000—and decreased participation in the sacraments. The number of priests in the diocese is also expected to fall from 200 today to 112 in 2025. This situation is not unique to Pittsburgh. The Archdiocese of Hartford is in the process of merging dozens of parishes and expects its 212 parishes to be consolidated into 85 over the next decade. Last year, the Archdiocese of Chicago, where an estimated 240 priests will be available to serve as pastors in 2030, launched “Renew My Church,” a major consolidation and renewal initiative for its 351 parishes. What a Rust Belt quest for a missing statue taught me about devotion. Today, the church does not have the personnel to staff these parishes or the resources to maintain their properties. There is no way to meet the present challenge without a significant degree of real loss. But that does not mean these decisions have to be pitched as zero-sum battles. Any decisions to close or merge parishes should be preceded by an extensive period of consultation with parishioners. In Pittsburgh, for example, the diocese allowed a three-year period of discernment that included meetings with nearly 30,000 parishioners. Parishioners, for their part, should make a good-faith effort to see the bigger picture beyond their parochial walls. Focusing on what can be gained through consolidation—resources for outreach to young people, services to the poor, better liturgies—places the understandably bitter loss of “my” parish in the proper context: the entire church. That church is not a collection of buildings but a living body that can experience loss but also rebirth. I agree that ultimately the Church is people, not buildings, even sacred spaces. such as churches. As I live in the Archdiocese of Philadelphia, I can confirm that in my lifetime (I 'm 56) a number of churches have closed, or parishes have been consolidated due to a decrease in Mass attendance and a decline in the number of priests to staff them. It's sad when a church closes but sometimes it's inevitable in my opinion. I do think that consolidation of parishes may lessen the emotional pain of people. While I support the continuation of celibacy for priests in the Latin rite, I read recently in Our Sunday Visitor that the number of permanent deacons in our nation is increasing, which is encouraging in terms of having more people to assist priests with the needs of the people of God. Although I still financially support when able my parish (I'm retired, and have a limited income) as a nursing home resident, I miss attending Mass at my parish. However, I do my best to be a decent Catholic. I watch Mass on television every Sunday and on holydays, and each Sunday attend a Communion Service conducted by an extraordinary minister of the Eucharist. I also am fortunate that my kind pastor visits me each month for the Sacrament of Reconciliation. Also, once a month a priest celebrates Mass at my nursing home. Since our population is aging, I believe that serving the needs of the elderly, especially those who no longer have the ability to live alone but need care, is both necessary and compassionate. I certainly appreciate that I can participate in the life of the Church with the assistance of kind priests and extraordinary ministers of the Eucharist. I agree with the article. However, the priests in the parishes to be closed need to be sensitive to the pain being felt. Parishioners need to be involved in final decisions as much as possible. Priests need to be comfortable with painful, difficult conversations....not run away from the people who are hurting. Priest training is sadly lacking in this time.....autocratic decision making to avoid hard conversations leads back tomclericalism of the past. Bishop Zubik decision to close parishes, will only lead to a greater decline in Mass attendance. People, who have had a long attachment to a neighborhood parish are not going to attend a church, which does not reflect the familiarity of their current parishes. I would ask the diocese of Pittsburgh etc to cite examples where this approach to falling attendance has worked. Smaller parishes are the root of the Catholic Church in America. These are the parishes which have put Catholic Christian teaching to work in their respective communities. The editors cite a three year discernment process, which obviously was only meant to alert these parishes of their future. There apparently has been no discernment by the Bishop or the Church in general. Perhaps the Church in its discernment should ask the following before closing parishes across the country: Why can't priests be married? Why can't their be women clergy? Why can't these historically immigrant parishes reflect the current immigrant community? And finally why is it that a Church, whose members represent the richest people in America, won't support these financially struggling parishes? The editors state that it is not easy to close parishes, likewise it is not easy to grow and change the Church, but it must and will happen. Information that is always in waiting by the visitors. This article also appeared in print, under the headline "When Parishes Must Close," in the May 28, 2018 issue.